This course covers essential exam skills and language for IELTS in approximately sixty hours’ teaching time, and familiarises students quickly with the exam. The course covers both the Academic and General Training modules It provides students with invaluable advice on how to maximise their band score in the exam. Shorter, achievable exam-type tasks build students’ exam skills, before students try the more challenging tasks at authentic test level. The test practice sections at the end of each unit together constitute a whole sample IELTS test. The ‘With answers’ edition contains a full answer key and information on the exam, making it ideal for students preparing independently. For students with more time, the pocket-sized Personal Study Book provides extra vocabulary, grammar and writing practice. The Self-study Pack contains the Self-study Student’s Book and Audio CDs (2). 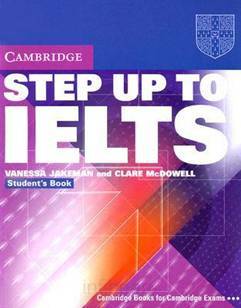 Step Up to IELTS covers essential exam skills and language for IELTS in approximately sixty hours of teaching time, and familiarises students quickly with the exam. The course covers both the Academic and General Training modules. Shorter, achievable exam-type tasks build students’ exam skills, before students try the more challenging tasks at authentic test level. The test practice sections at the end of each unit together constitute a whole sample IELTS test. Thanks, complete and perfect file! cảm ơn anh/chị rất nhiều ! Thankx for the link and password.